The war of words over Zlatan’s new book continues. BAYERN MUNICH PRESIDENT Uli Hoeness has branded Zlatan Ibrahimovic an “aggrieved prima donna” after the Sweden star’s latest verbal attack on coach Pep Guardiola. In his autobiography, Ibrahimovic recalls shouting “you haven’t got any balls!” at Guardiola after making a brief appearance off the Barcelona bench in one match after the coach prefered to play Argentina’s Lionel Messi up front. And in an interview with German magazine Spiegel, Ibrahimovic gave a fiery answer when asked what he has against Guardiola, 42, who he dubbed “the Philosopher” while at Barcelona. “Guardiola is a fantastic trainer, but as a person? He is a coward,” said the 31-year-old Paris St. Germain forward. “He isn’t a man. In the first months at Barcelona things went well and I scored lots of goals. “Then he sacrificed me for Lionel Messi, but didn’t have the guts to tell me. Bayern boss Hoeness has said the Bavarians are very happy with Guardiola’s work and dismissed Ibrahimovic’s latest comments. “We totally disagree with Zlatan Ibrahimovic. We are completely satisfied with Pep Guardiola,” Hoeness told German daily Bild. “I think Ibrahimovic is an aggrieved prima donna who has not coped well with his departure from Barcelona. Hoeness added he has “no sympathy” for Ibrahimovic. “He just wants to distract from the fact that he has failed at many clubs. “He told me with a pencil where I should run and I told him: ‘look mister, you can’t tell me anything – go into your office and write some letters’,” Ibrahimovic told Spiegel. 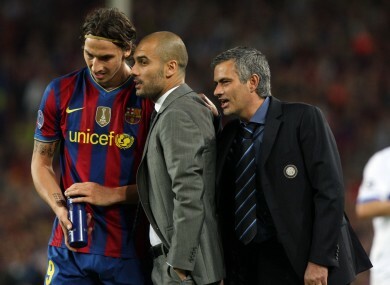 But current Chelsea boss Jose Mourinho, who coached Ibrahimovic at Inter Milan received high praise. “I’d have died for him, he is outstanding, highly intelligent and an incredible motivator,” said Ibrahimovic. Email “Meow: Munich hit back at 'aggrieved prima donna' Ibrahimovic”. Feedback on “Meow: Munich hit back at 'aggrieved prima donna' Ibrahimovic”.